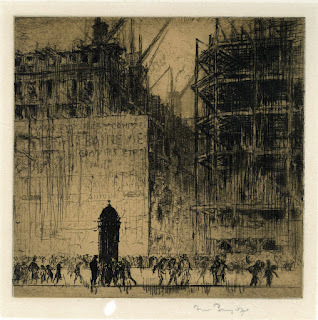 I first came upon the work of Frank Brangwyn during an Australian artist residency at the famous Cite des Arts in Paris. While away for a few days I visited Bruges in Belgium and happened upon the Frank Brangwyn museum. While there I viewed his etchings (and other works) for the first time. 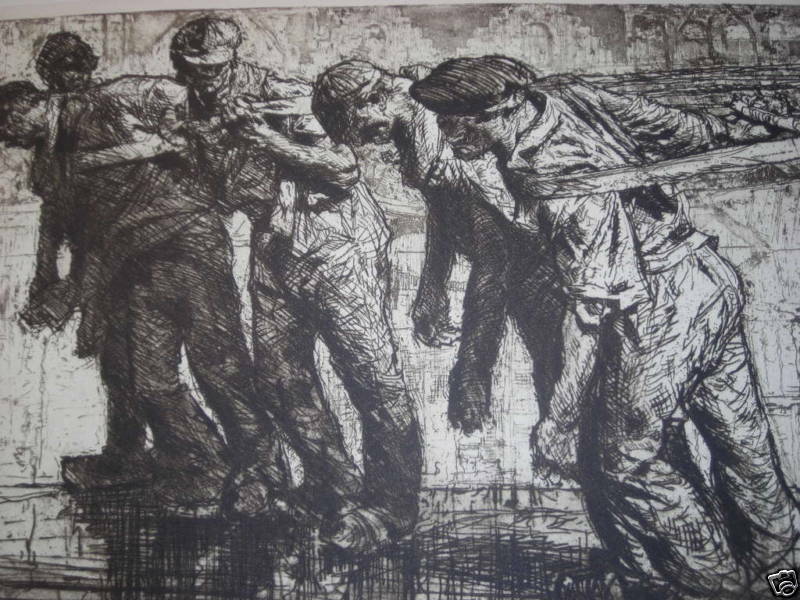 I had no idea then who Brangwyn was or that he spent much of his life in the UK as a successful artist and teacher. 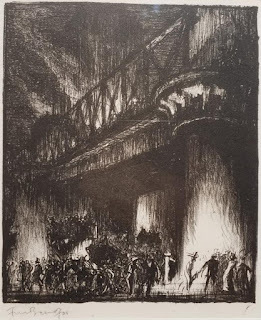 I also did not realise then that he had a direct influence on Australian printmakers from works of his that made their way here as well as through one of his then student, Jessie Traill (who studied with him in London in 1907) and became one of the ground breaking printmakers of Australia. I have always been struck by the scale and raw energy of Brangwyn's etchings as well as his gestural but accurate use of line. 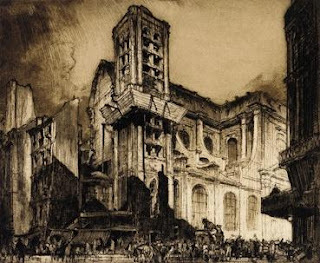 Like Piranesi he often highlighted the grandeur of architecture and machinery against the minuteness of the human form. This relationship gave his work its sense of scale. Some structures seemed to have an anthropomorphic aspect and seemed like huge beasts that the small figures were interacting with. I was also intrigued by the under wiped plate tone he used to add tonality and depth to otherwise clean areas of the plate. This also gave an individual quality to each print that he pulled from the press. Many of the Brangwyn etchings in my collection came from other collectors in Australia. He was obviously an artist that has built up a network of admirers throughout the world. 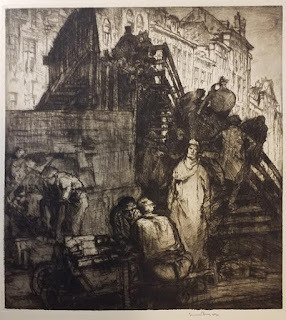 In spite of this I believe Brangwyn is a seriously underrated artist whose work is still very affordable but whose works will one day be better known. The Tow-Rope is for me one of the great Brangwyn etchings. This large work made in 1906 has a monumental feel because of the sculptural nature and positions of the drawn figure group. 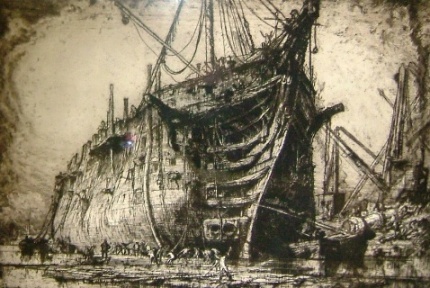 It shows six men straining on ropes which are pulling a barge which is not visible in the etching. The men are seen working as one to complete their grueling task. 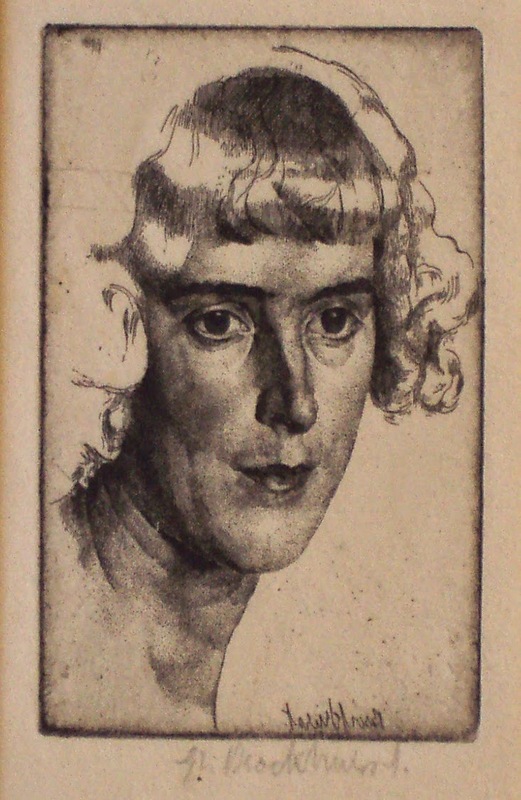 The etching is charged with emotion and reveals many attributes that followed later in the prints of the German expressionists. Temporary Wooden Bridge at Ghent is another large Brangwyn etching which the artist from an earlier larger plate that he maned initially as Old Houses Ghent in 1906. Brangwyn reworked parts of the left hand side of the plate before making a new edition in 1920. The etching itself is difficult in parts to define and because of this the figures take on a mysterious persona. 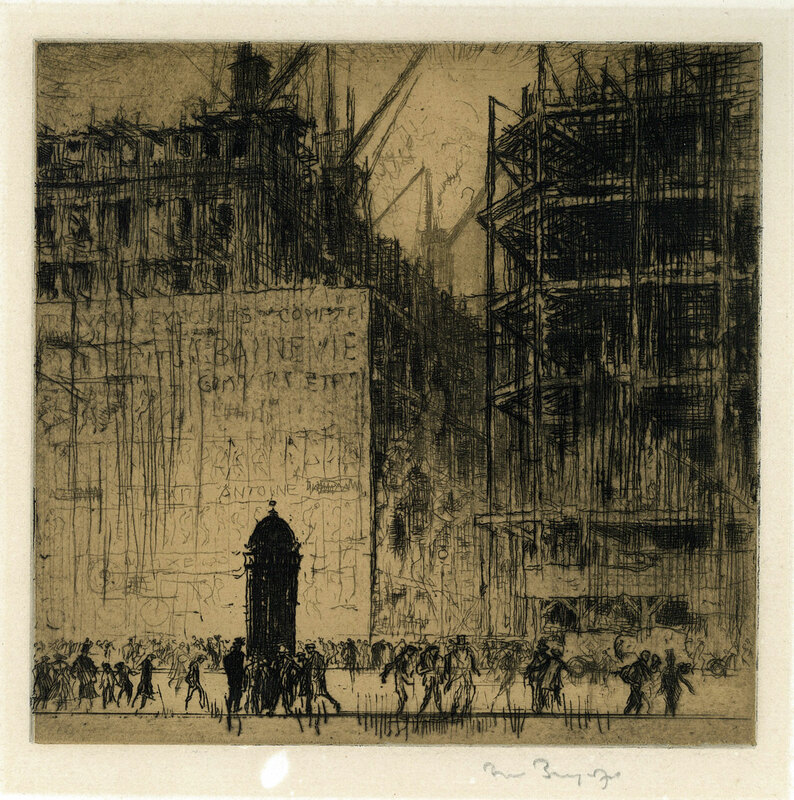 Frank Brangwyn used many different printmaking mediums including lithography. This example of a station although small reveals a sense of grandness because of its low view point as well as its use of scale in contrast to the small figures on the street below. The use of strong light also helps to give a theatrical quality to the image. 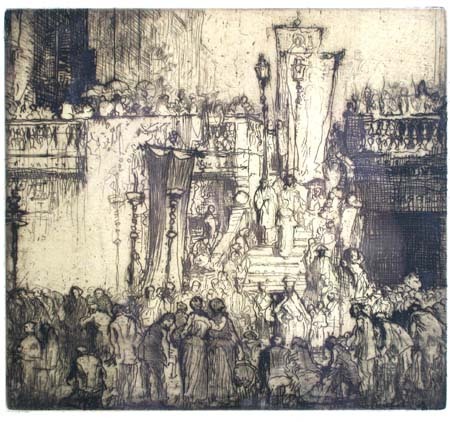 This plate was etched from a watercolour Brangwyn made of the Church and tower of St Nicholas in Paris. The Church stands on the corner of rue des Bernardins and rue St Victor. Like many other large Brangwyn etchings of architectural forms the human figures is used to contrast the grandness of the Church. The plate is under-wiped in parts to provide extra tone in specific areas. In Townsville we have rarely been blessed with visits by art experts and cognoscenti from overseas. However thanks to Ron McBurnie this April turned out to be something of an exception in the event of a visit from UK of Mr Jolyon Drury the Author of Revelation to Revolution: The Legacy of Samuel Palmer, The revival and evolution of pastoral printmaking by Paul Drury and the Goldsmith’s School of the 20th Century. We were entertained with a fascinating and scholarly presentation regarding his father the distinguished artist-printmaker Paul Drury. It was a great experience to be afforded the unique insights that can only come from a close family member, into the career and character of his father and circle of artists he was part of. As an overview of the talk has already been provided, my attention to one print in particular namely Paul Drury’s A Distant View of Reculver 1932, a small and for Drury a rather spare etching depicting a view of the abbey-church towers at Reculver. 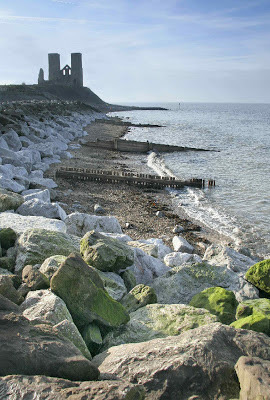 It is probably worth mentioning that Reculver-from the Roman name REGULBIUM-is situated on the north Kent coast in the south east of England, facing the north sea and located between Herne Bay and Westgate. I thought it might be of interest to share the reasons for one small print resonating with me so profoundly. The image of the towers was for me immediately recognizable, as I had seen them from a similar distance on many occasions over a number of years. Although Drury’s view was made from St Nicholas at Wade, which is several miles inland, and some 4 ¾ miles from Reculver, my view of the towers was from Minnis Bay, Burchington on sea, which is only 3 ½ miles distant. The towers do however look very similar from both locations, but what is different is the foreground and middle distance. The prospect from St Nicholas, as depicted so well by Drury, is of flat grassy fields with small stands of trees which extend into the marshlands. Although St Nicholas is very close to Minnis Bay the view is significantly different. Seeing Drury’s print not only reminded me of the many wonderful childhood summer holidays spent there but also the fact that the view of Reculver towers as seen from Minnis Bay was also the subject of my very first faltering attempts at plein air painting. The towers held a great fascination for me, mysteriously silhouetted against a summer sky in the late afternoon, sitting atop a promontory which marked the western extremity of the sweeping curve of the bay like a “full stop”. To the right a view of the vast expanse of the North Sea, glittering in the sunlight and the curving beach with its hundreds of black breakwaters surmounted by a sea wall – originally a huge earthen bank covered with grass and wild plants. To the left there were flat grassy marshlands, punctuated by dykes extending away to the distant railway line (and though unseen) to St Nicholas at Wade the location from which Drury made his print. Skylarks were always to be seen over the marshes with their peculiar dipping flight and wonderful trilling song perhaps “the quintessential sound of an English summer”. As a post script I should like to mention that in spite of the fact that I went to Burchington on so many occasions and that Reculver towers were ever present on the western horizon, strangely I never actually got to see them up close until the summer of 2003 – some 4 ½ decades later – whilst on a family visit to the UK from Australia. · Burgess, Jennie (2010) Burchington Kaleidoscope, Birchington Heritage Trust, UK., P65. My interest in the work of F.L. Griggs began a little after I had purchased my first etchings of Samuel Palmer and began to investigate some the artists who had come under his spell. 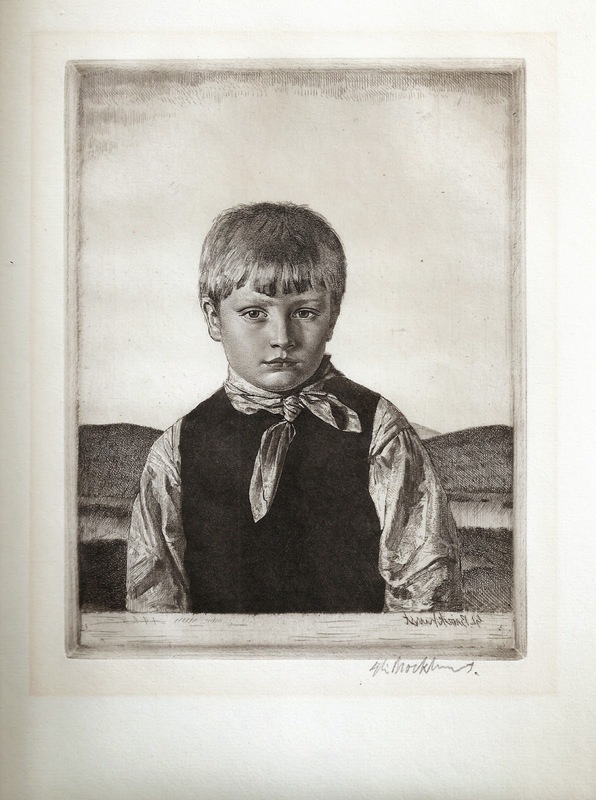 I first purchased Griggs small etching titled Laneham (1923) and have slowly built up a modest collection of his work. Griggs was many things to different people. 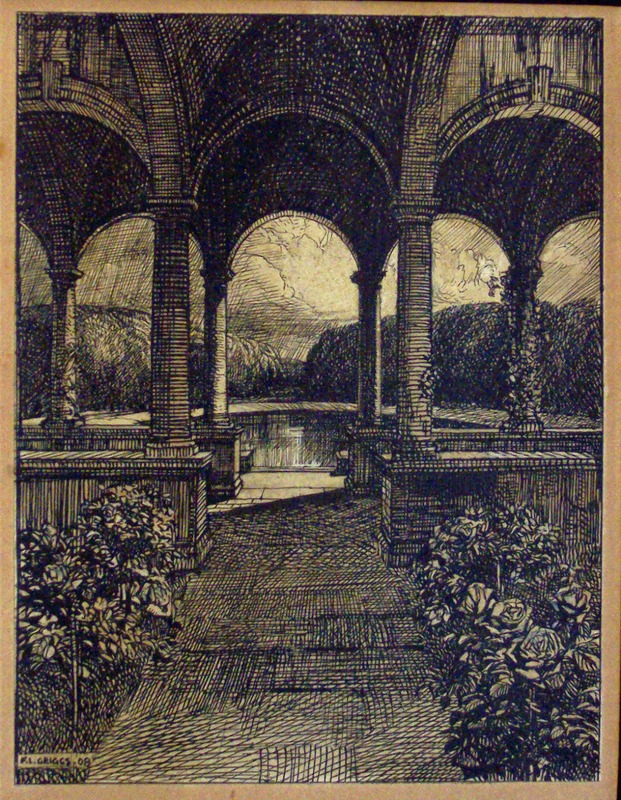 For me he was a great draughtsman who possessed a unique poetic vision of English architecture. Sometimes the architecture he drew inspiration from was imaginary and was channelled from the an unspoilt past age; etchings like Saras and Priory Farm are examples of this preoccupation. The marks he drew onto the plates were often quite intricate and like Palmer in many of his plates he has overlayed successive etched layers of marks to create rich dark passages while still allowing small areas of white to glint through. During the latter years of his life Griggs was involved in an ongoing battle to save many of the ancient buildings and land (Dover Hill) in the Chipping Camden area from demolition and developers. He spent much of his own funds to preserve a number of buildings of historic importance. He died during the great depression when print prices in general had fallen and many artists were struggling to make a living. Unfortunately Griggs did not see a resurgence of interest in his marvellous etchings. This small etching was part of Print Collectors Club commission members print. Griggs used part of Church Laneham, Nottinghamshire as the subject, one of the church subjects he had previously drawn for Highways and Byways. A delicate light can be observed falling on the walls of the church and a partly shadowed figure can be seen either resting or praying inside the porch of the church. After a new year’s eve feast with the Campden parish church bell ringers, Griggs began a pencil sketch of Sarras. 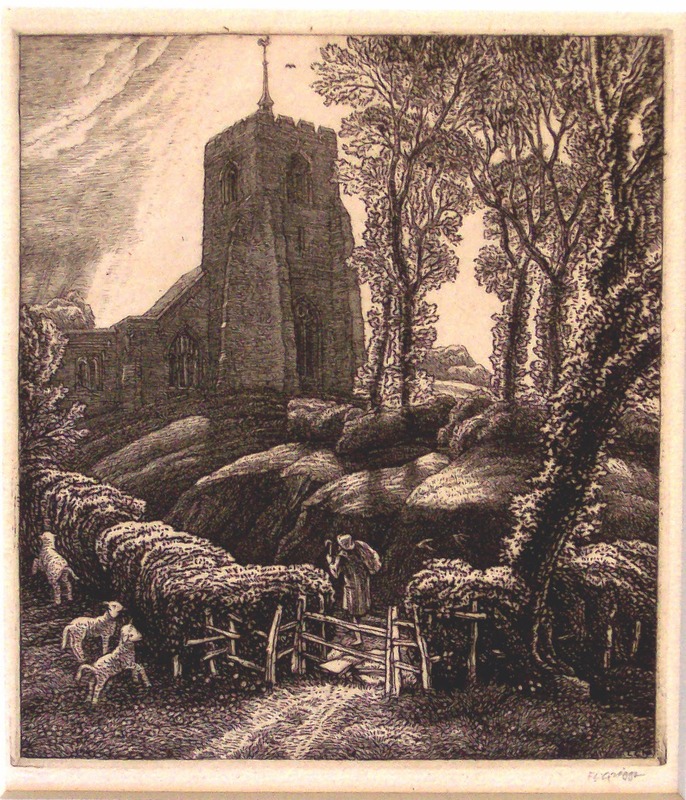 Both the Sarras and St Ippolyts etchings relate to each other. 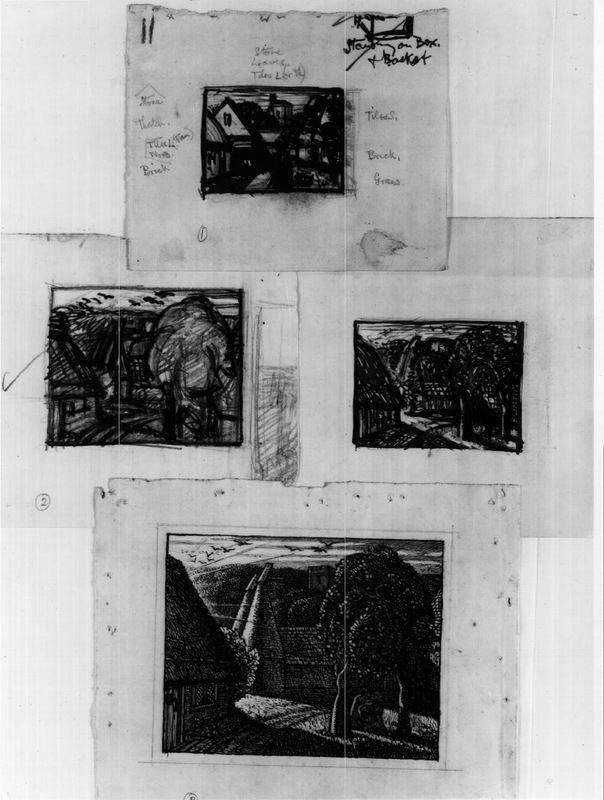 The making of each etching overlap in time and both were also made during a very turbulent and stressful period in the artist’s life when he was building his grand home in Chipping Campden. Both etchings are also integrally linked to the visionary imagery that the artist pursued. In St Ippolytes Griggs has described the three lambs as symbolic of his three children. It is worth considering that the elderly pilgrim or shepherd with his burden may be a symbol of the artist on his journey to his visionary Sarras. 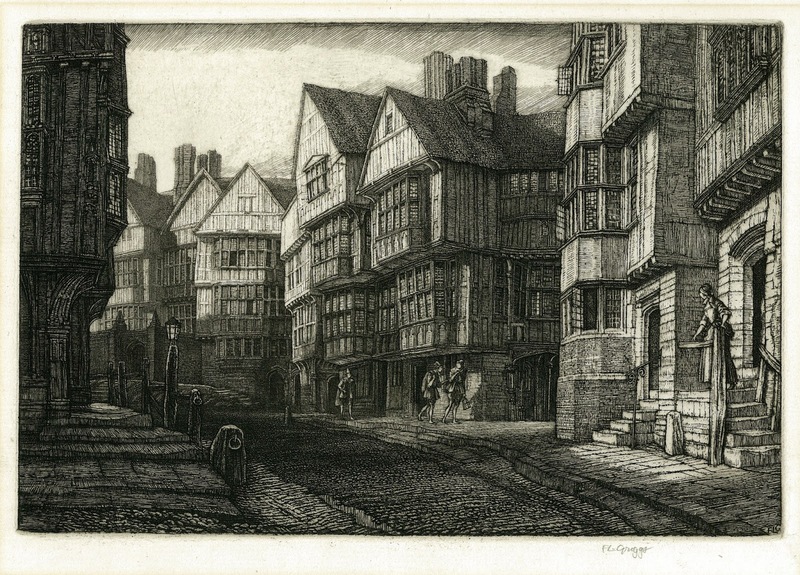 This etching was made two years before the artists death and is an imaginary image of London during Shakespeare’s time. 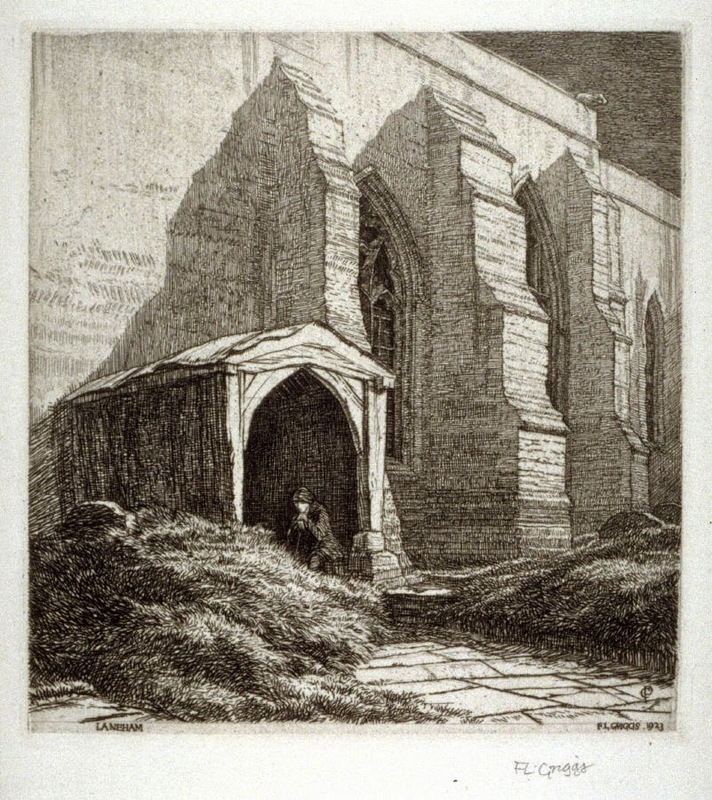 The later states of the etching include a subtle clouded sky and the massive church tower in the distance. The drawing it is based on is in the collection of the Boston Public Library. 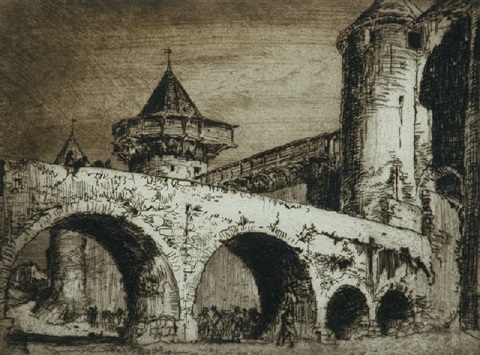 In the etching Griggs uses heavier areas of tone and strong shadows. This foces our eye to move up toward the lighter more ethereal areas of the cloud and the church tower at the top of the composition. During his life Griggs made many illustrations for different books and Journals; the most famous being the Highways and Byways travel series. 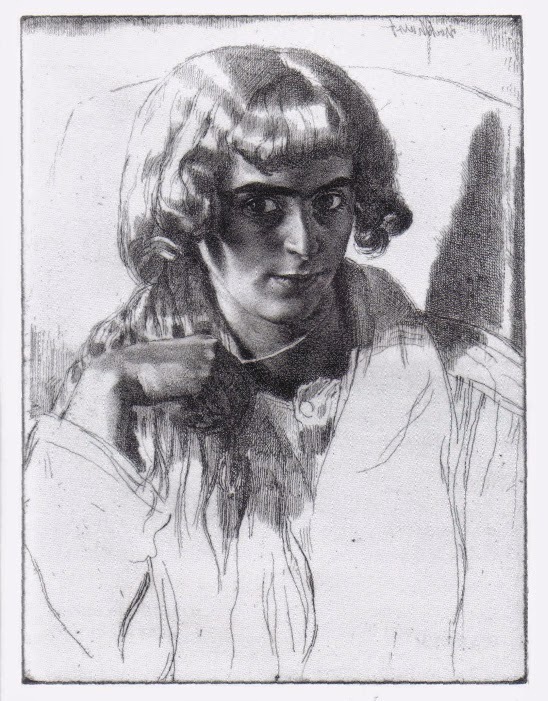 The drawing above was made for an article in volume 44 of the 1908 edition of International Studio. 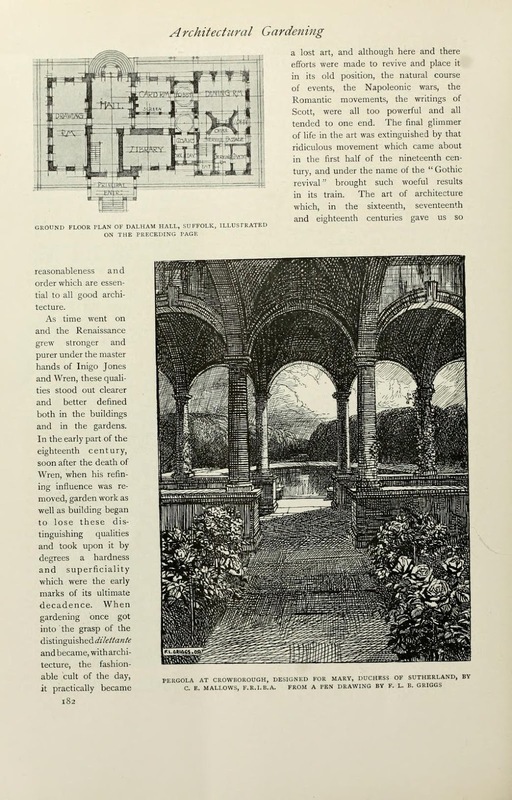 The article was titled International Gardening by the British architect, C.E. Mallows F.R.I.B.A. and became a continuing feature in future issues. Griggs also continued to produce many drawings for Mallows articles. 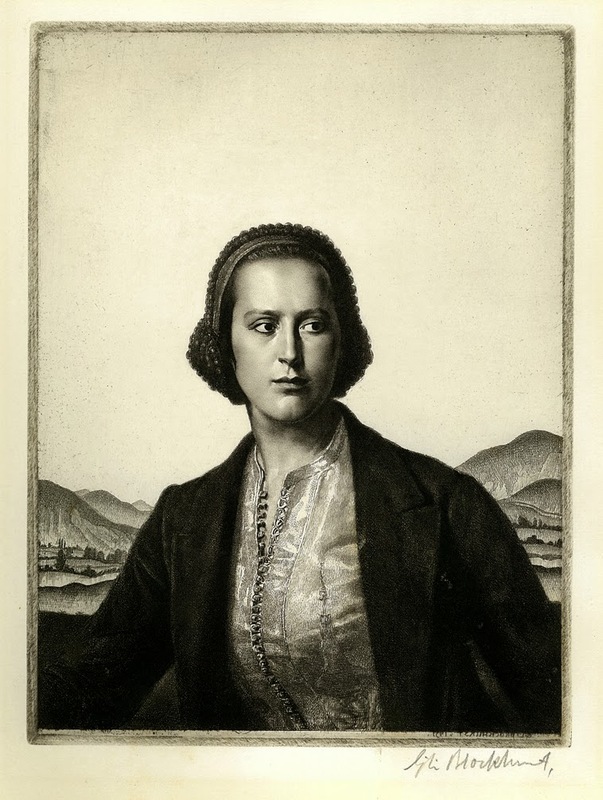 The caption beneath the illustration reads, "Pegola at Crowborough designed for Mary Duchess of Sutherland by C.E. Mallows.F.R.I.B.A. From a pen drawing by F.L.E. Griggs.” The article also includes the architectural plans for the stately building but so far I have not been able to find whether the building was ever constructed.